LOCATION Kilnwood Vale is a sustainably built and superbly located development where residents can become involved in their community and share the benefits of a high quality of life. A wide range of local services, including a brand new primary school ( opening September 2019 ), will be available to residents and the new community will be served with excellent public transport links. This collection of new homes in Faygate village is located on the green belt area near Horsham, which offers a fantastic shopping experience with a superb array of high street and independent stores. There is a train station in Faygate, connecting local residents with Portsmouth and London, making this an ideal location for commuters. PROPERTY This beautiful home was built in 2015 by Bovis Homes to their “Kestral” design and sits on a good sized plot on the popular Kilnwood Vale Development at Faygate. The property boasts large bedrooms and generously sized living accommodation and is ideal for a family. The downstairs accommodation comprises of a good sized living room that is naturally very light due to its dual aspect outlook. The kitchen/diner has plenty of space for a six seater dining room table, the separate kitchen is of neutral décor with plenty of surface and storage space. The kitchen has many integral appliances, with double doors leading to the rear garden. The downstairs accommodation is finished off with a neutral W.C. On the first floor there are two large double bedrooms, the master is a generous double with en-suite shower room. 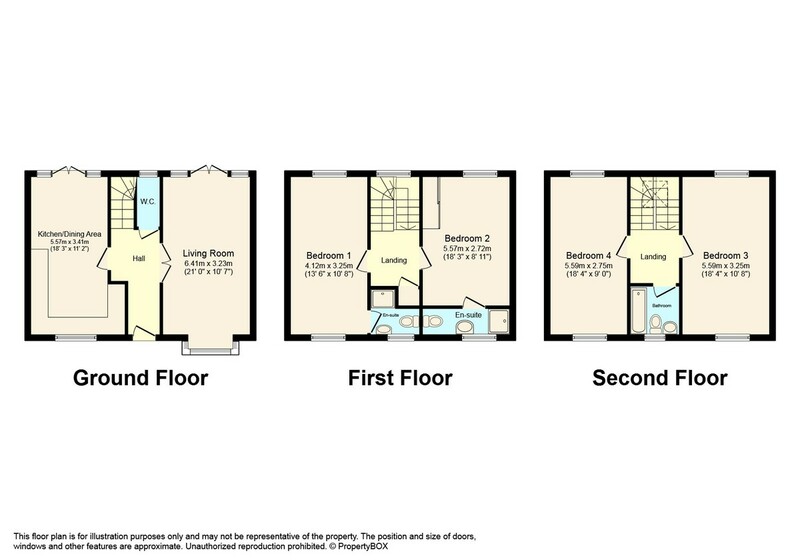 Bedroom two is also a good sized double with a built in wardrobe and walk in shower room. On the second floor the bedrooms are equally as big and both are very similarly sized with space for double bed and bedside furniture. The family bathroom offers bath and overhead shower. The sleeping arrangements have plenty of flexibility as to however a potential purchaser would like to have the master bedroom set up with all bedrooms a similar size. OUTSIDE The front of the property has a small herbaceous border, a large driveway offers parking for three vehicles, with a freestanding garage. The rear garden is a good size with patio area and lawned garden it is a great space for a keen gardener to maintain and enjoy.